Liven up any room in your home with the Black Gold Snake Plant, a low-maintenance houseplant that thrives in full to partial shade. Its deeply green leaves feature bright yellow-gold edges—a stunning color combination. The leaves grow straight up from the soil, adding height and plenty of visual drama. They grow slowly, but eventually can reach up to 3' tall, which fills out a bare corner nicely. Since its leaves resemble succulent leaves, they don't take much watering. In fact, it's recommended to let the soil dry out completely between waterings. 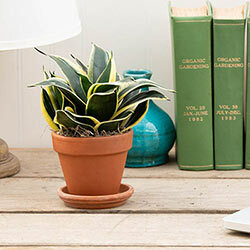 If you're looking for a durable houseplant, this is a solid choice—it'll continue to grow and impress for years to come. 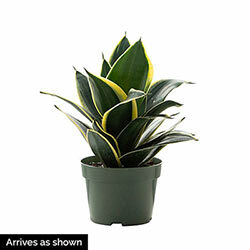 Foliage Type: The snake plant has long green leaves edged with a golden trim. Planting Instructions: Keep the snake plant at the same soil level when planting in a new pot. It will generally not need to be moved to a larger pot for a few years. Soil Requirements: Keep the soil slightly moist but do not over saturate the plant. Winter Care: Give more indirect light to your snake plant during the winter due to shorter days. Additional Information: Mildly toxic to pets and humans. Blooms white-green flowers on rare occasions.